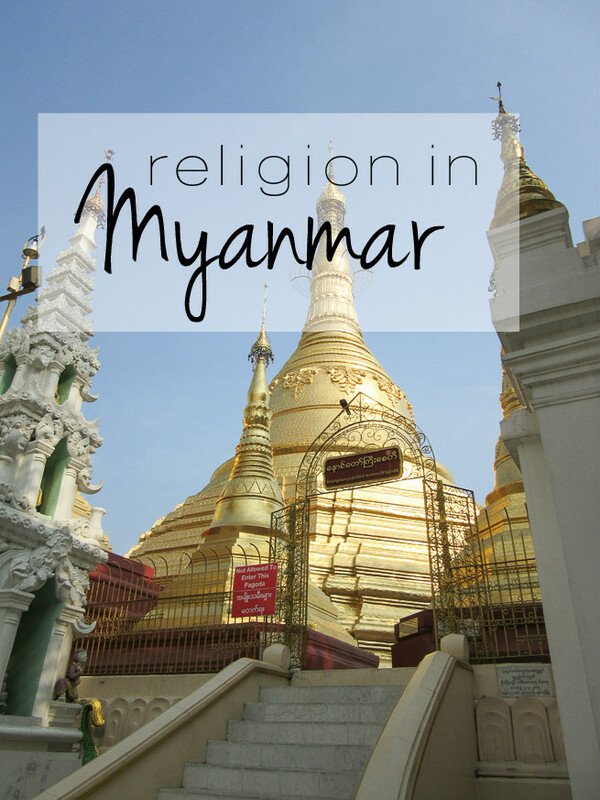 A couple of weeks ago I shared about politics in Myanmar and today I want to share about religion in Myanmar. Religion is a huge part of the culture and it integrates into just about every part of their life. 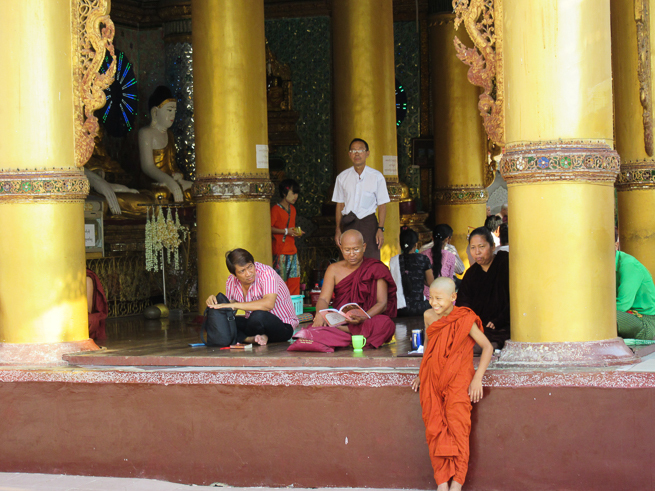 I think the longer we were there the more we would see just how much Buddhism is integrated into their culture. 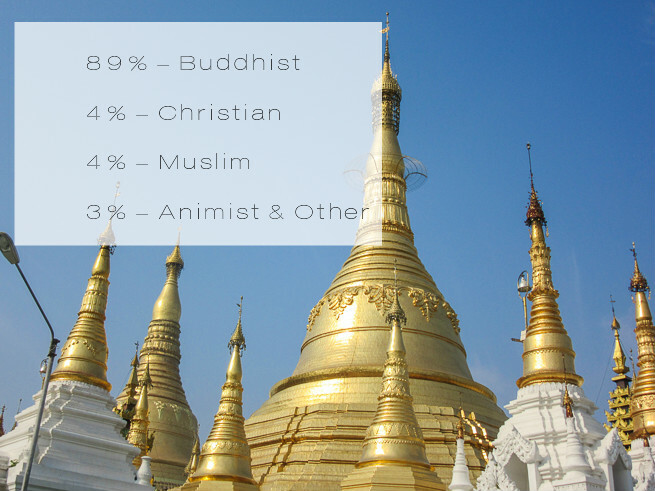 Here are some quick facts about religion in Myanmar and as you will see Buddhism is the dominating religion there. I know many people view Buddhism as a peaceful religion where people meditate but it is in fact quite the opposite. When you look at Buddhism through the light of The Bible it is so sad to see how trapped the people of Myanmar are. They are constantly doing a good work in hopes of earning a better status in the next life and it starts at birth and continues until the day they die. 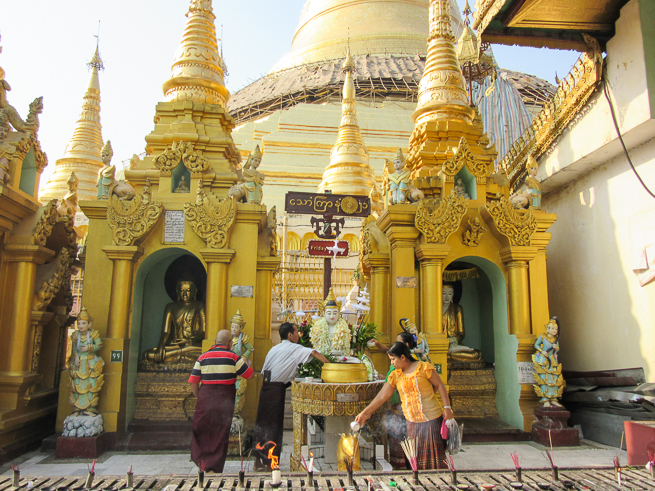 The majority of the Myanmar beliefs and practices ares summed up in three big things: Buddhism, fortune telling/superstition and karma. Somehow they mix all three of those into every area of life. It's intense. It is very weird to me and to be honest the root of it is Satanic. It makes me so sad to see the people there so sincerely worshipping knowing it isn't correct. Buddhism starts at birth, literally. 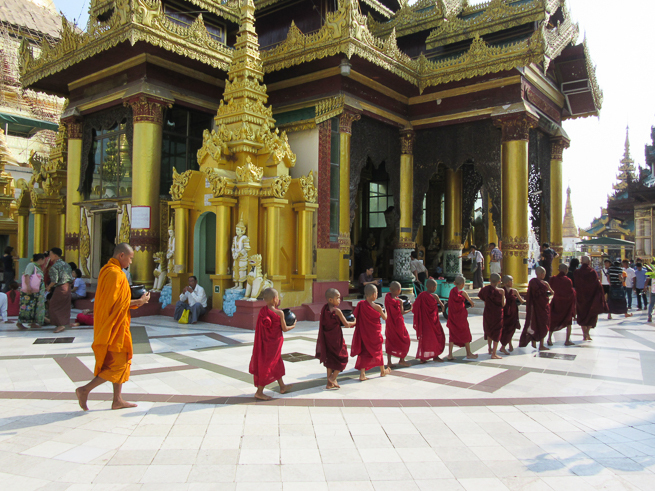 There are no natural births done in Myanmar. The fortune teller will tell the Mom what day she should deliver her baby on and then she goes in for a c-section. After the Mom delivers the baby she isn't allowed to eat anything but broth for one week nor can she wash her hair for one month because superstition says if they eat or wash their hair they will die. Superstition and it's best I tell ya! But seriously - if I birthed a baby give me all the burgers please! Every Buddhist home will have some type of idol in their house that they pray to, burn incense to or offer food to. 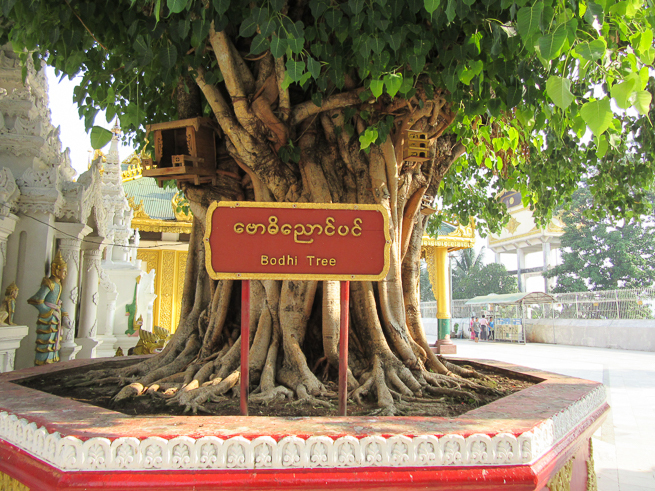 They also have these beautiful banyan trees that they believe to be holy and will put an idol in the tree. Apparently, Buddha himself became enlightened while sitting under a tree so that is why they deem them to be so holy. 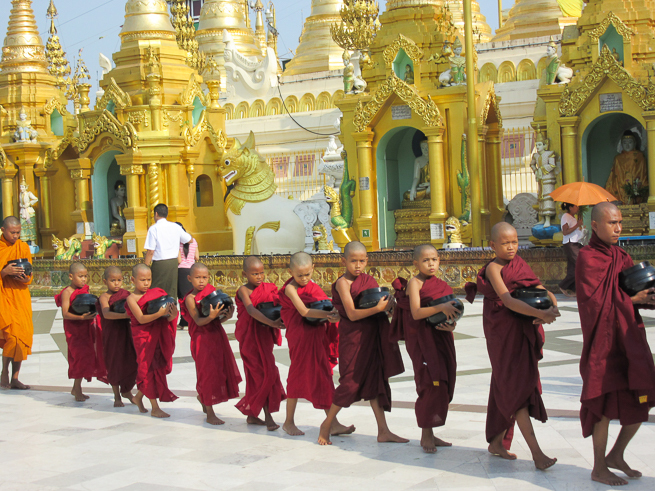 Every child who grows up in a Buddhist home is expected to be a monk at some point during their childhood. How this works is that there is a special ceremony where the Mom will help shave their hair then they got to a monastery for a couple of weeks. Monastery life isn't just for children. Adults can become a monk for life or they can go in for a couple of weeks or a couple of months. There are times where someone has done something wrong so they go become a monk for a while to pay back for their bad deed. I don't know what all they do at monastery but I can tell you that they start chanting super early in the morning. They also all have a rice bowl and will get in a line and go through neighborhoods and everyone will put a scoop of uncooked rice in their bowl. Monks don't purchase their food they have to beg for it but of course, people give generously because they are banking on good luck and karma so that they will come back as something better in their next life. Girls also get monked and go to monastery and let me tell you, girls and women gotta work extra hard because they are pretty much nothing in Myanmar society. Women can not achieve Nirvana, the highest level a Buddhist can reach, because they are a .... woman! Women work really hard and hope to build up enough karma and good luck to come back as a man in their next life. Even a 90 year old grandma on a bus will have to stand for a 20 year old monk to have her seat. Wrong on so many levels and I'm so grateful Jesus loves women! Buddhism is in the market shops too. If I was the first customer at the market they would take the money from the first sale and tap it all over the booth. This of course, brings them good luck for the rest of the day. Everything is 'lucky lucky' there and they say that word a lot! Even in bargaining they would say "this price is lucky lucky for me" and I would come down with a lower price and say "Well, this is my lucky lucky price." They sometimes try and pull the luck card with foreigners and after I figured it out I just said it right back. Not only is Buddhism in their daily actions but there are pagodas everywhere on every block and in every home. 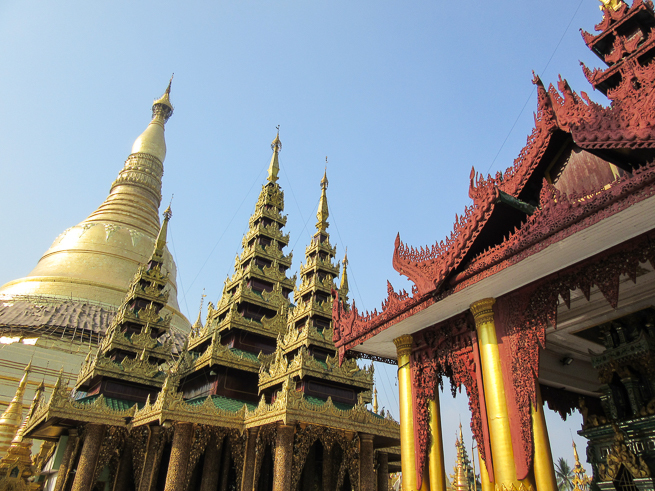 I have no idea how many Buddhas and pagodas are in Myanmar because there are more than I could ever count. 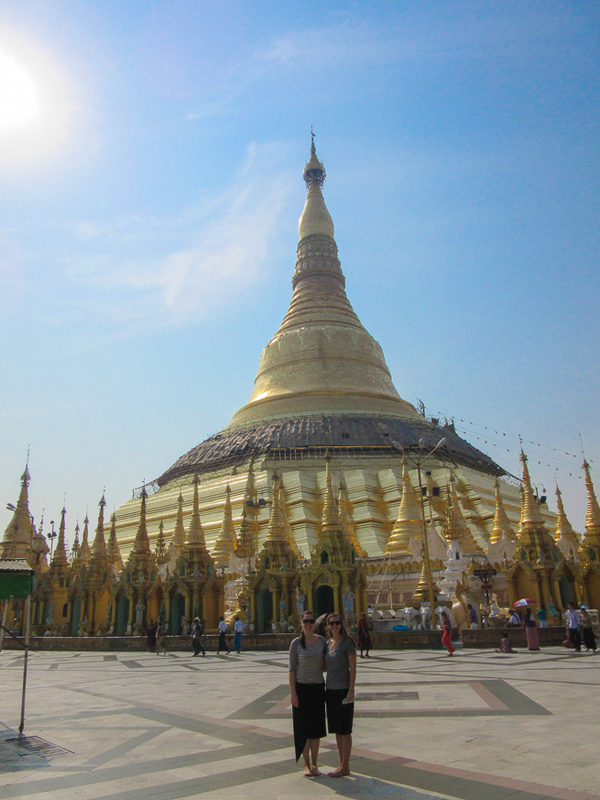 The biggest pagoda in Myanmar was located in the city we lived in in and is called Shwedagon Pagoda. 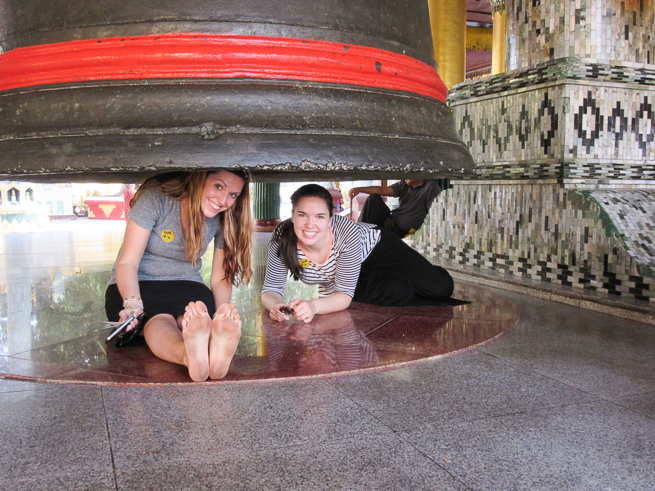 The pagoda is free for locals but costs $8 for foreigners. 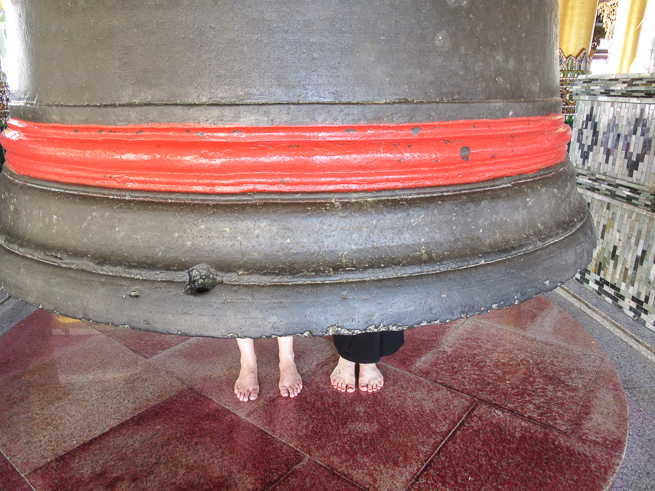 When you enter any pagoda in Myanmar you can not wear shoes or socks. This is gross to me because so many other feet have walked there and birds poop there. That is what I would call 'no lucky no lucky'. 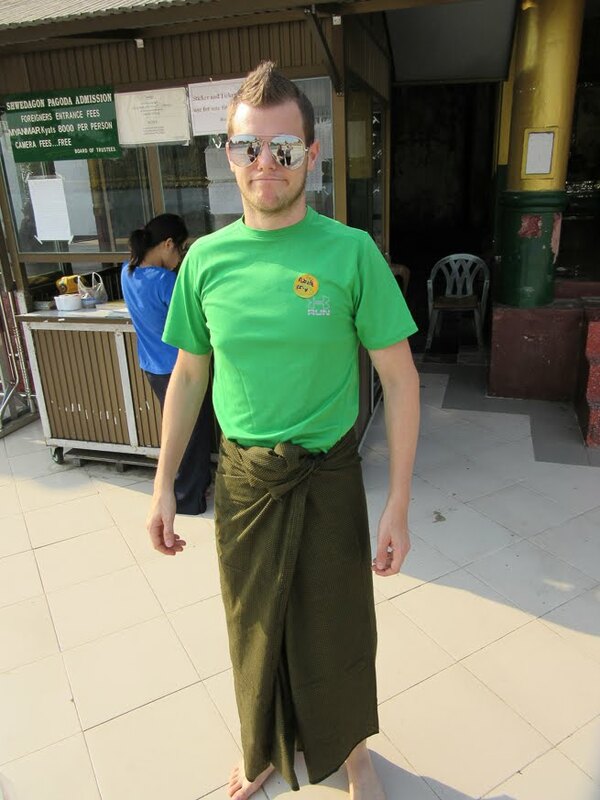 You also must be dressed appropriately to go into any pagoda there. A shirt with sleeves is a must and you must have shorts or a skirt that goes underneath your knee caps. If you don't have appropriate dress wear you can rent clothes from them. Dave chose to wear shorts above his knee cap so he got to rent a skirt that day. ha aha ha! And they do indeed have someone checking dress code so no sneaking by! 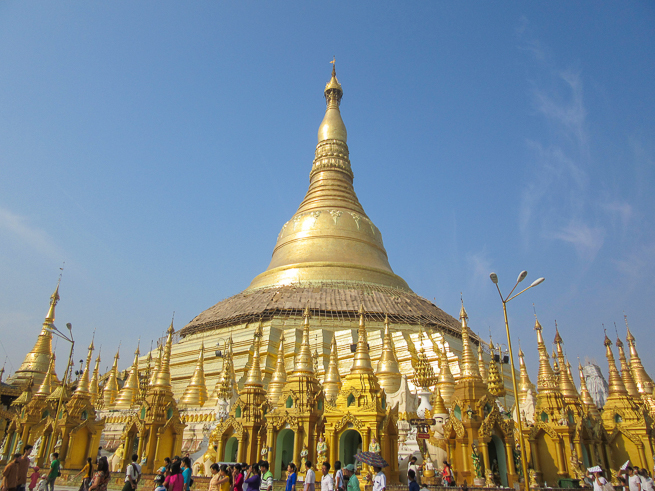 Shwedagon is circular and has seven major stops. Each stop is a day of the week so whatever day someone were born on they go to that day. Most people go on their birthdays and will pour water over the Buddha, will kneel and pray to Buddha and will place their flowers. There are so many flowers that some times there is also a big trash can where they throw them in after the people who placed them have left. That is also known as a major waste of beautiful flowers God made. 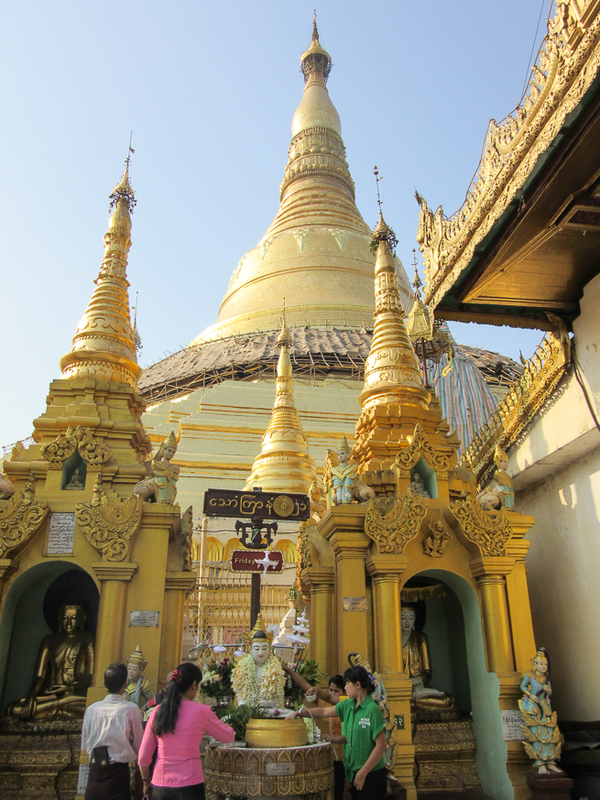 Shwedagon has a lot of gold in it and the top has many diamonds and precious gems. 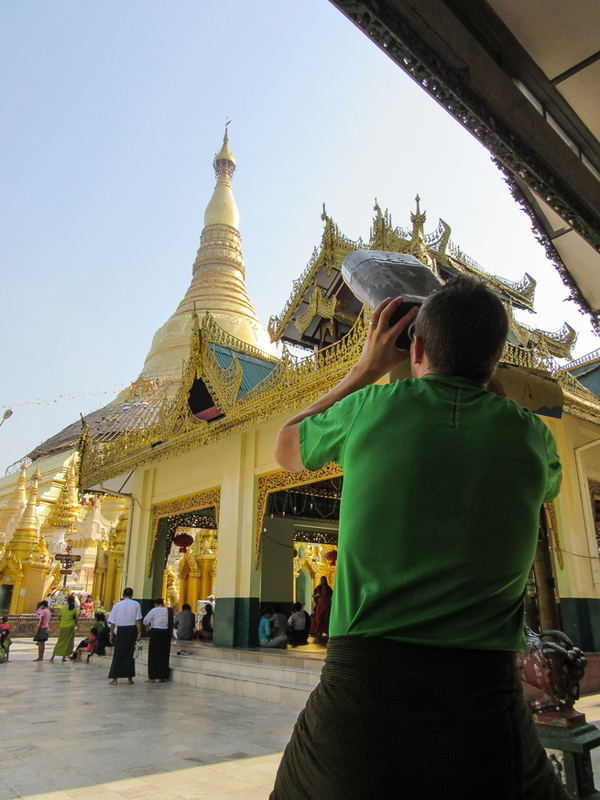 In the picture below you will see that part of Shwedagon is covered. Every few years they cover it and repair it and sometimes repaint it or put gold over it. I've been told that they always try to fix something on their holy sites or improve their Buddhas. When I heard that, the first thing that came to my mind was how thankful I am that God is enough! He doesn't need fixing or repairs. In fact, it is the opposite. Jesus came and gave His life to fix us. I'm so so thankful for salvation and that I don't have to fix my God. There are also countless other Buddha's around and buildings for people to pray and gain karma in. We went during summer once and my jaw dropped open when I saw these people pulling a big rope to fan Buddha. No words. Can you see the man in the picture below pulling the rope to fan this Buddha? There will also be a monk sometimes whose job for that day is to stare into the sun. Why? I have no idea but I'm guessing it earns him karma (and blindness)? Shwedagon was an interesting place to see because it really allows you to see the depth of their Buddhist beliefs but I will also tell you this: you can feel the darkness there. I really think there are demons there and the other part that is so sad to me is that Jesus is no where. You can feel what it is like for Him to be absent. It is so sad. I don't say all that about Buddhism to be mean but to share what is going on there and so you can see how important the gospel is there. There are many children at the school we worked at who grow up in Buddhist homes and making the choice to follow Christ is a really really big deal! It isn't just saying yes to Jesus but it is often saying no to your family. It is saying no to parents arranging a Buddhist marriage for you. It is saying no to generations of traditions and beliefs and sometimes saying yes to Jesus will leave someone ostracized from their family. but Jesus is worth all that. Because He actually has ears that hear. He has eyes that see. He has a heart that loves. He is love! With Jesus the next life isn't dependent on the day I was born or how much good Karma I have built but is completely dependent on Jesus Christ and His work on the cross. When we were in Cambodia the missionary told us some of the awful things he had done before he was a Christian. 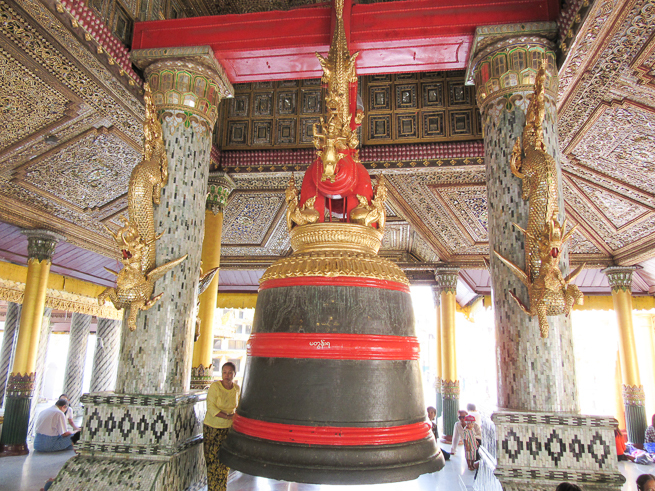 He said he would go to the pagodas to pray because he wanted to change. Then he said something to me that I will never forget for as long as I live. He said "Buddha has good teachings but only Jesus can change the heart." That statement is so so true! Only Jesus. Lastly, please pray for the kids at the school we worked at who have accepted Christ. There is a four year old who went home and told her parents she would no longer bow down to Buddha. That is Christ working in her and that is the faith of a giant, if you ask me. Those kids need prayer. Prayer that God will convict them of their sin and save them at a young age. Prayer that they will grow strong in their relationship with God. Prayer that they can stand firm. 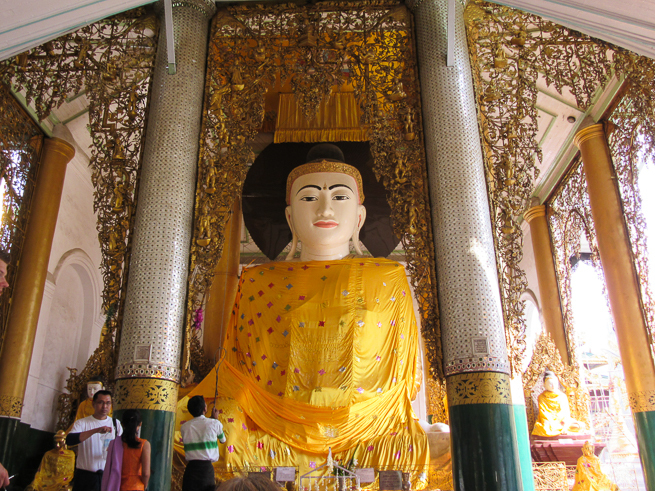 If you have more questions about Buddhism in Myanmar please ask me. I don't know everything about it because it is so complex but I will do my best to answer any questions you do have. Interesting. Such a rich culture. And yet so sad at the same time. I am so glad we serve a God who sees and hears and loves us. I especially love what you wrote about how thankful you are that Jesus loves women. Amen! This is truly heartbreaking. What an amazing thing you guys got to do over there, and continue to do as you pray for these kids! I read this when you first posted it but I guess didn't comment! Sorry, friend. This is interesting and sad. It's sad they spend all that time fanning buddah. I think it's good you were able to experience this. I'm sure it gives you a different perspective on our faith now. I am so thankful for God saving me! I could have been born into that culture and family. It's interesting to think about.